A query about a garden gate for one of my neighbours prompted yesterday's complaint about what is available as ethically sourced timbers in Australia. It also prompted me to pick through the design books last night, and to drive home from the now daily trip to the Husqvarna dealership on a very roundabout route. Looking for gates. 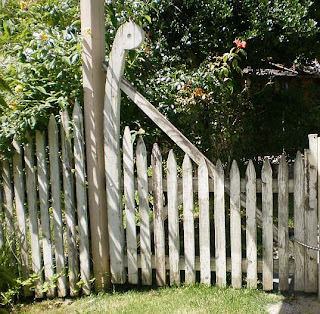 Gates rarely stand alone, but usually act as an opening in a fence. 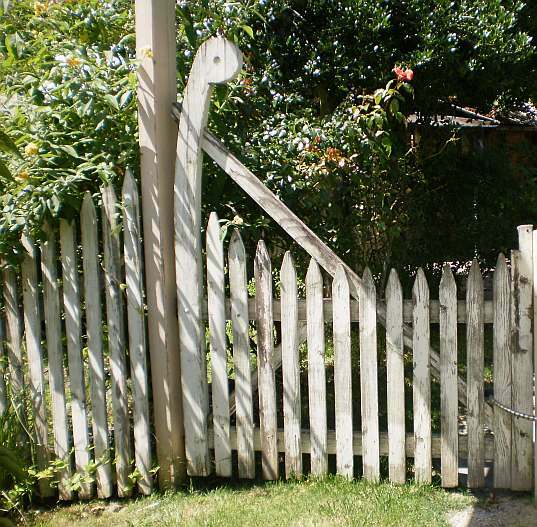 Bleeding obvious perhaps but gates can function as a sublimely beautiful object that is not only aesthetically pleasing but sweetness itself in its functionality. 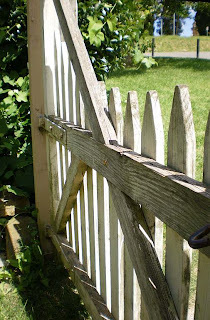 A well made and balanced hardwood gate swinging easily on its' hinges is one of life's moments of 'ohhhhhh'. A rickety concoction of wire and sticks can keep the chooks out of the vegie patch with its jaunty air of make-do. 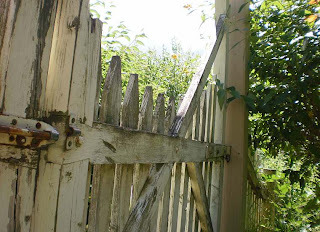 Opening and stepping through a gate into a garden marks entry, invite, expectation. They keep in, as much as keep out. What my first field trip of gate hunting revealed is how homogeneous the selection is; how dull they often are; how badly made they usually are; and how radiata pine has come to rule. 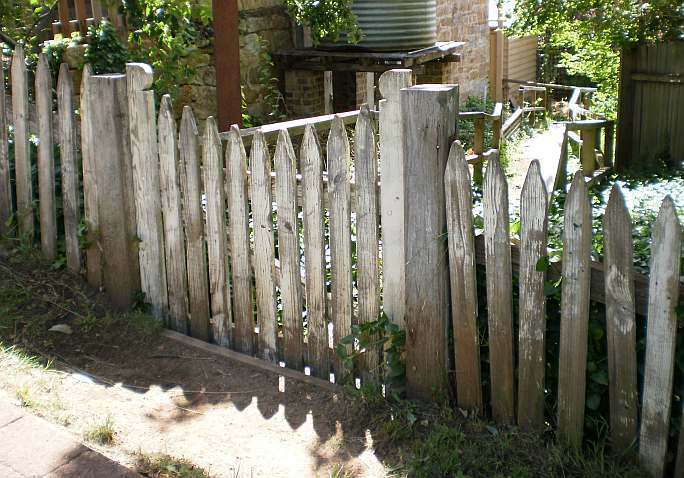 I'll leave aside the just plain hideous of colourbond or faux metal period fencing. Nothing says ugly quite like a brick veneer with a Sahara-like expanse of clipped lawn behind a 'no maintenance' modern metal fence. I'm afraid I can't quite come at the ease of care trumps aesthetics routine of so many of my fellow countrypersons. Being easy to look after does not excuse the ugly. The photos included here are mostly hardwood, although the rather lovely gate from the Old Bakery at Berrima is I suspect, western red cedar with a beautifully weathered oil based paint. 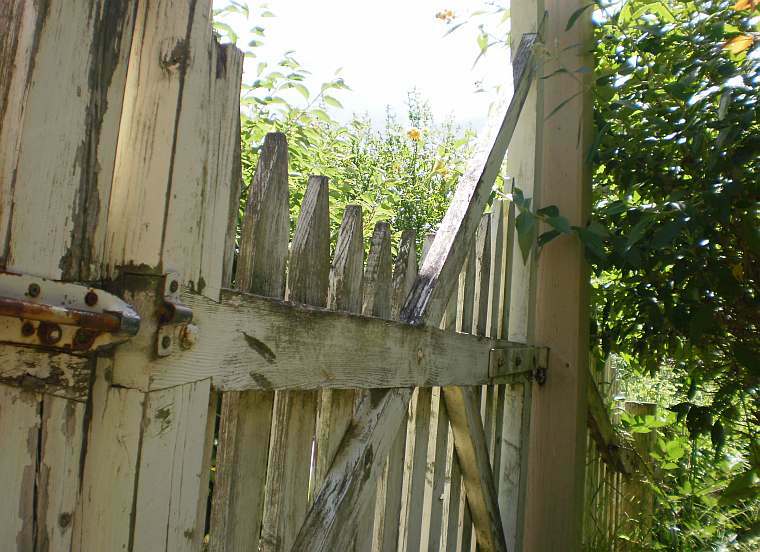 What also applies to some of these gates is that as dilapidated as they may be, they all still function. Probably with a certain amount of cursing and grumbling, but beauty always has a price. 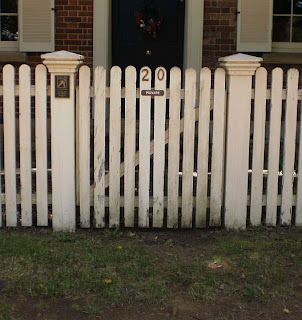 This double gate which graces the side entrance of the Old Bakery has had a rather unlovely treated pine log placed in the middle of the driveway at its juncture. 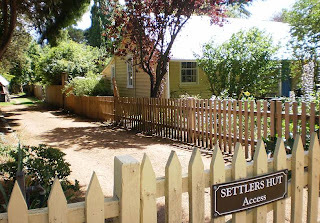 Presumably to stop all those ramraiders desperate for another carload of country style clutter from within the gallery, but nevertheless, it is beautifully scaled and built gate and fences. Some of the construction details are clearer in the photo above. And this is one of the appealing traits of objects such as gates, wooden boats, musical instruments and in my universe, furniture - the process of making and the engineered response to use are plainly in view - form follows function perhaps but never at the expense of the nature of the material or the aesthetic needs of the user. To the left of the image you can see the lap dovetail joint that's been used at the end of the top rail. 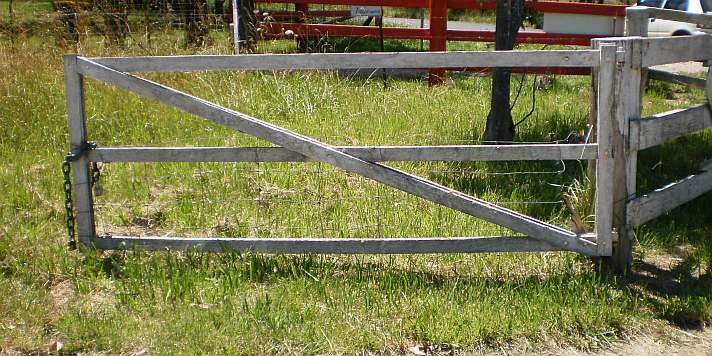 As the weight of the gate is levered out along the horizontal cross pieces, this joint is more than able to bear the load without distorting or easing, whilst at the same time, quite quick to cut and fit. 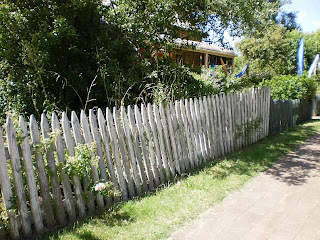 The fence above is still intact - a day's work of replacing the posts would give this section of the fence another decade at least. 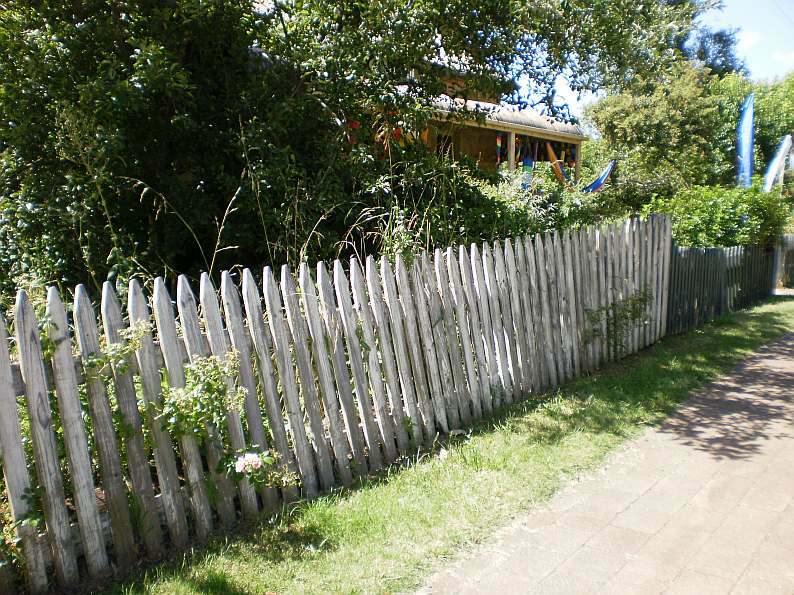 Note also the benefit of using oil based paints on weather exposed timber - as well as having faded to something lime washed in character, the paint has acted as an effective wood preservative. What also is extremely important when building gates and fences is to keep as much of the structure away from the ground as possible. 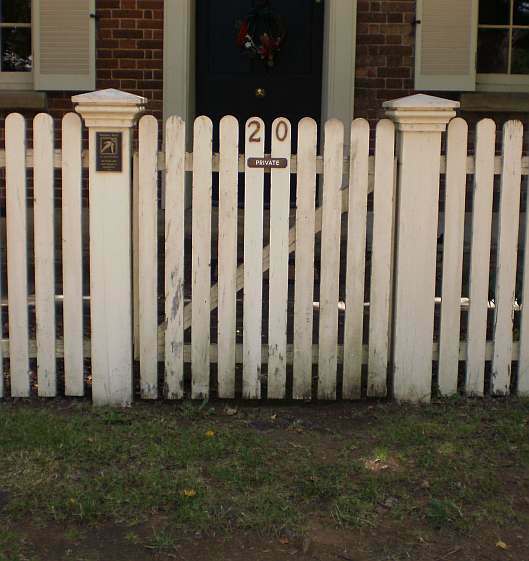 Keep your palings or infill up off the dirt and it will greatly slow rot. Cut a drip line in the underneath of your rails or angle the bottom of each rail so that moisture runs away from the palings and posts. Despite the ponderosa attempt with the hardwood arch, the Cecile Brunner rose and the lichen wreathed gate mark the age of the gate. As you can see in the photo above, the whole of the right end rail is missing - sitting in the dirt, it probably had rotted out. 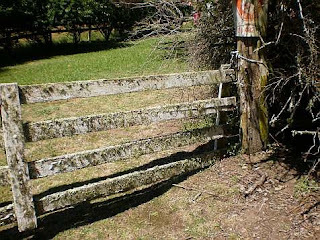 This gate would see out another 25 years at the least if that end rail is replaced with a hardwood piece, and the soil dug away to give it clearance. Cutting the rose back a touch would also help; plants increase the humidity of the immediate environment, and a dense thicket of climbing rose is not ideal. 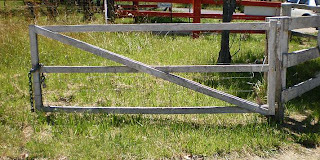 What this gate and the one above show is how much span you can ask hardwood in small dimension to cover. 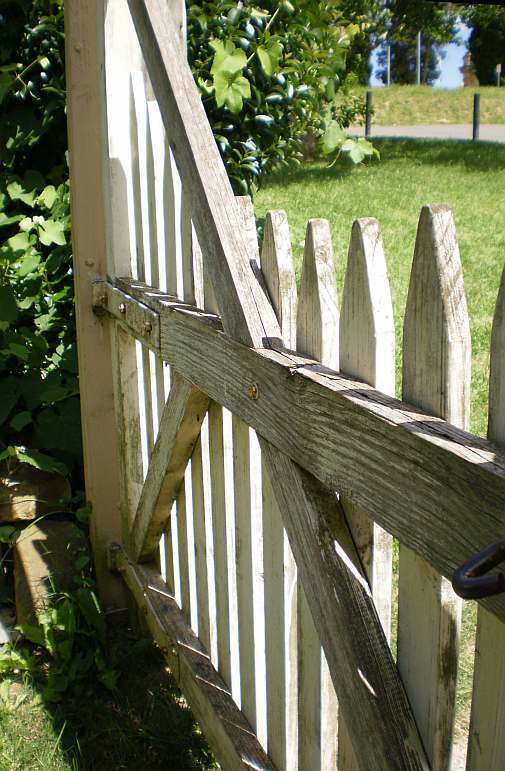 Though the gate has dropped, its more a matter of straightening the plates or rods on the hinges; the hardwood structure is still stiff. 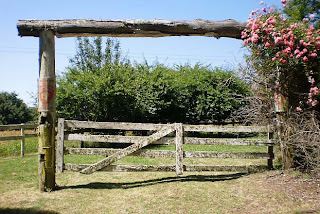 As much as I love the ubiquitous rusty farm gate of Australian agricultural habit, a hardwood gate can last as long if a bit of basic maintenance is occasionally done. And finally this style of gate is very common on drives and paddocks around the district. Mortises, lap joints, lap dovetails are very rare, but this construction technique can be found in hardwood, radiata and occasionally Western Red Cedar. 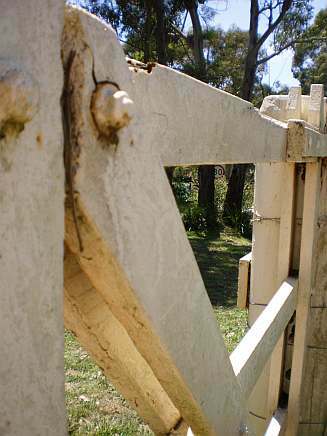 Bolted together, it gets around the problems of glue failure, using a framing process for making a stiff gate capable of spanning a 2 metre reach if necessary. 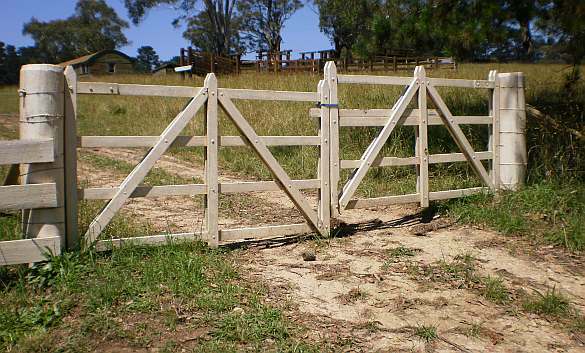 Gates are a wee statement of intent; the sudden appearance of a brick and metal gate ensemble with a large Euro-referencing name plate, solar panel charger and remote opening says 'Country Estate' in no uncertain terms. Must be simply frightful when you've left the remote back on the granite kitchen bench top in Mosman.